Prepare your child for his or her first visit by taking a positive approach. Try to convey good feelings about dental visits and express to your child that visiting the dentist is a part of growing up. Please do not say: “the dentist isn’t going to hurt you”. Instead say: “the dentist is going to sparkle your teeth and count them and show us how to keep them healthy”. Please do not use the dental visit as a punishment. Some parents may think it is funny to tell their child that if they are bad while at the dentist then the dentist will give them a shot or pull out their teeth. This only scares the child and makes for an unpleasant first visit. Expect that your child will do well and chances are they will. Parents are encouraged to accompany their child during the visit. We ask that during the appointment the parent remain a “silent partner” since it can be difficult for a child to pay attention to more than one person at a time. Please understand that crying can be a normal reaction for young children. Age one dental visits help promote good oral health. 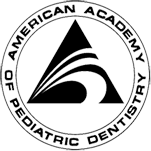 The academies of the American Dental Association (ADA), the American Academy of Pediatric Dentistry (AAPD) and the American Association of Pediatrics (AAP) all recommend that a child visit the dentist by age one. This visit allows us to help educate parents about their child’s oral health and how to prevent oral disease. The goal of our office is to prevent dental decay and age one dental visits are one of the ways to accomplish this goal. Please contact our office to learn more about this service. Dr. Yamagishi performs all the examinations on your child, even when the hygienist does the cleaning, Dr. Yamagishi will come over to evaluate growth and development and evaluate for decay. Our office utilizes digital x-rays to help diagnose decay and other pathology. Digital x-rays use 80% less radiation than conventional plain film x-rays for the safety of your child. Our office recommends “cleaning/preventative” visits every 6 months unless the doctor discusses other arrangements. These visits allow us to monitor growth and development, help prevent tooth decay or detect tooth decay before it causes pain, and maintain good overall health. We are also developing a relationship with your child that will help to prevent anxiety and, in the long run, lead to better overall health. We provide all services your child may need to restore their teeth to good health. Our office uses white fillings. We also utilize stainless steel crowns when necessary. Dr. Yamagishi will discuss what treatment options are the best for your child’s needs and will gladly answer any questions you have regarding any recommendations made. There are three different forms of sedation. If you would like more information on the varying forms of sedation please discuss with the doctor. Nitrous oxide is an inhaled gas that helps reduce anxiety and makes dental treatment easier for the patient. The doctor will discuss this option with each parent and help the parents to make the decision if this is best for their child. In certain situations a child may need extra help to cooperate during dental treatment for these children our office offers oral sedation. The doctor will discuss this option with each parent and help the parents to make the decision if this is best for their child. Patients with severe decay, special needs and/or uncooperative behavior may benefit from having treatment completed in a hospital setting under general anesthesia. Dr. Yamagishi has extensive experience in treating children with a wide range of special needs. Please feel free to contact our office to discuss the special needs of your child prior to your appointment. If your child has an emergency, please call and we will do our best to see your child the same day during business hours. Occasionally an emergency will cause us to run late with regularly scheduled patients. When this happens, we ask for your understanding and will do our best to keep you informed.